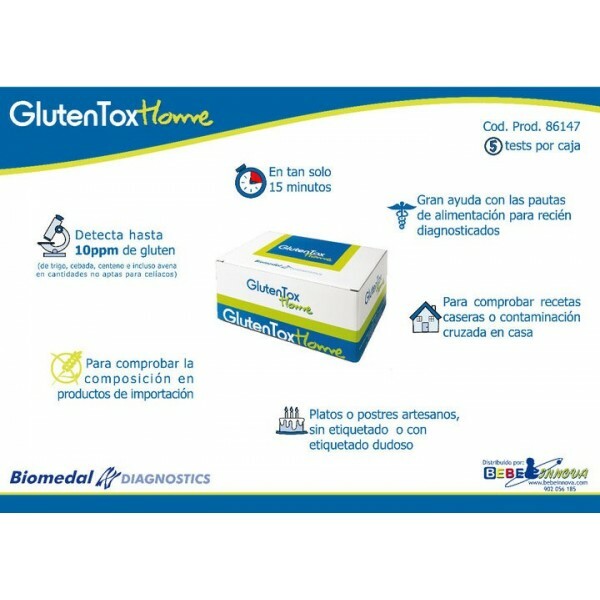 Biomedal GlutenTox Home (tests for the presence of gluten). Home GlutenTox By yourself you can easily check if the food you consume is suitable for coeliacs Home GlutenTox detects the presence of amounts of gluten from wheat, rye, barley and oats, which can be harmful for the gluten intolerant. Each kit can GlutenTox Home 5 tests. 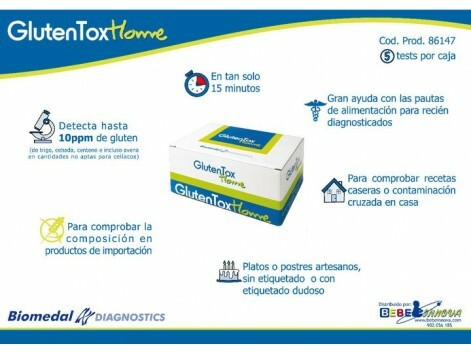 GlutenTox Home is a rapid test to detect in food and beverages gluten harmful to coeliacs. Home GlutenTox contains a new antibody, G12, developed to specifically recognize the toxic fraction of gluten in wheat, barley, rye and oats that triggers an autoimmune response in celiac patients. The specificity of this technique prevents the accidental ingestion of foods containing these cereals. One advantage of this technology is the ability to detect levels of some types of oats that can be harmful for people with celiac disease.